I have NEVER before been a fan of having a TV in a bedroom. I never even use to watch TV! Shame on me for firing it up one night to see what everyone else was talking about. Ok, well, aside from PVRed Survivor and Fixer Upper of course. Anyway, the ‘ol travel trailer flat screen was stored between my bed and the wall for YEARS. So when I upgraded my Shaw cable package to include a 2nd TV remote thing that worked off the main, (maybe it’s Shaw’s fault?) the TV came out of hiding and was plunked on my dresser to see if I’d even use the thing. Boy did I! My Netflix prayers had been answered! Plugging in a speaker system really meant for a computer, this rig up all jammed together on the top of this white numbered dresser did the job ok for the time being. One day I’d dress it up some I’m sure. 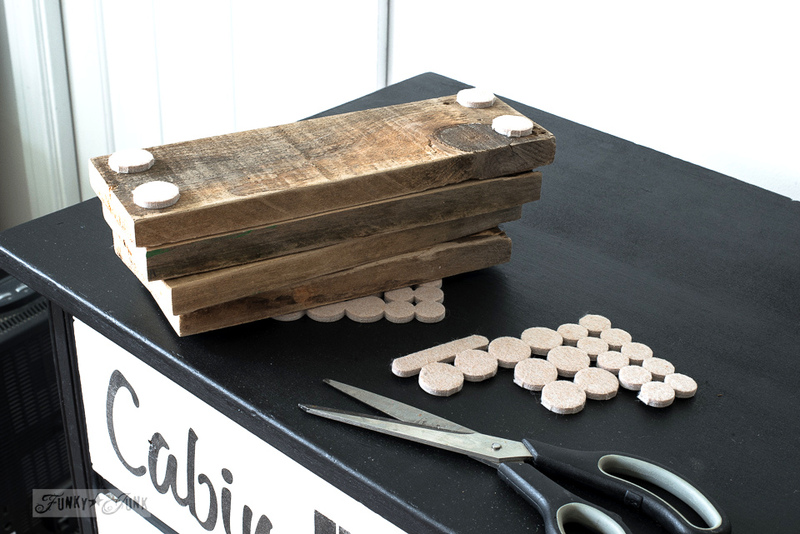 Who needs Pinterest when you have a messy garage workshop to inspire you?! Reclaimed pallet wood planks for two risers and one larger board for the top. Cordless drill, drill bit and screws. 1. 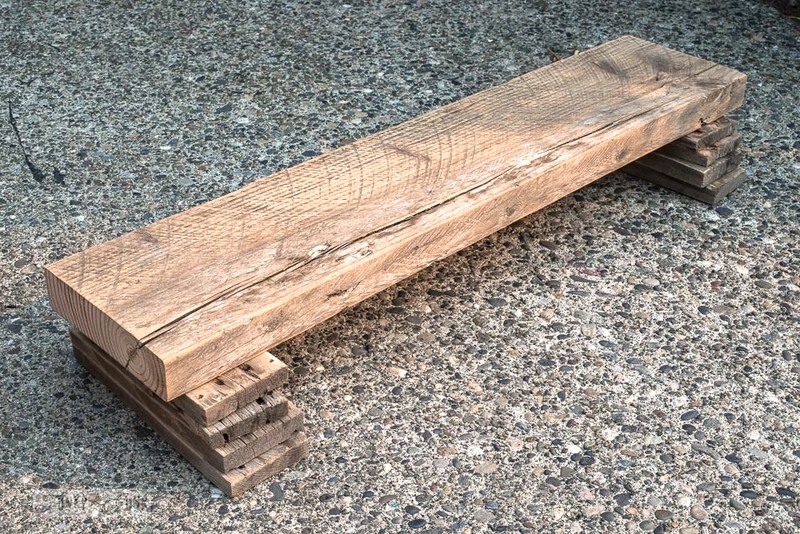 Gather up a large plank of wood for the top, and smaller stacked wood for the risers. 2. 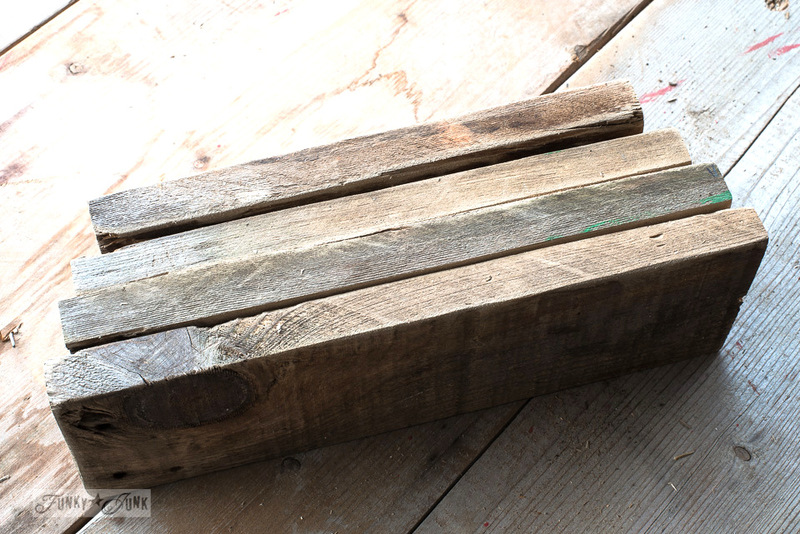 Stack some pallet wood as risers to desired height, then cut from smaller to larger as shown, leaving the fronts the original cuts so they look naturally aged. 3. 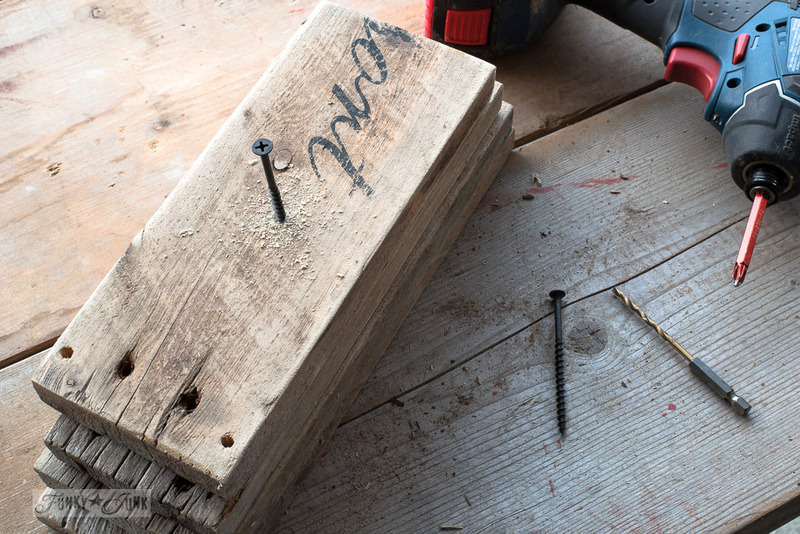 Drill a hole into the centre of the stacked wood, then loosely insert a long screw. Slightly twist the stacked wood into the desired position, then tighten the screw all the way. 4. Do another riser, then lay the larger plank across the centres of both risers. 5. Add felt protectors to all four corners of each shelf riser to protect the surface of the newly painted dresser thankyouverymuch! 6. Position shelf on top of dresser (once painted), then screw the risers to the dresser top from behind. 7. Screw the shelf to the risers from the top, driving a long screw into both. I obviously didn’t care if I made holes in this old dresser. That’s the beauty of free repurposing I suppose. 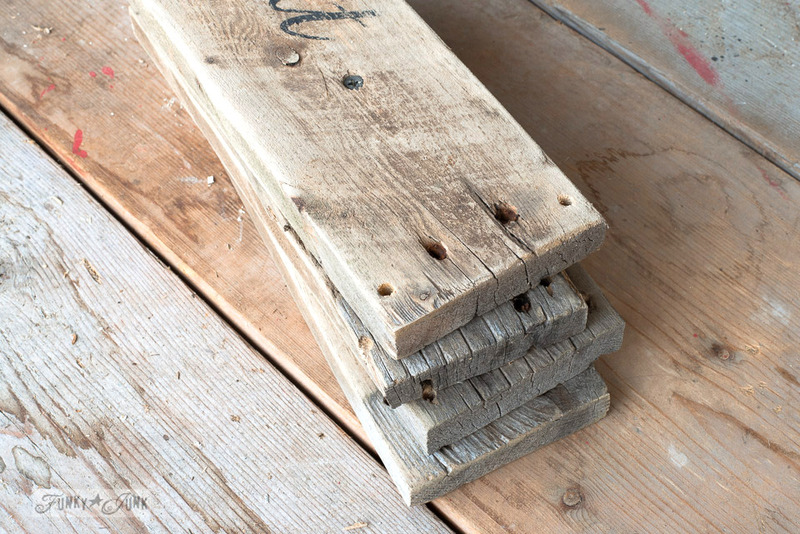 I first used it in my entry WAY back… rescued from someone’s barn. 8. Position TV and components. 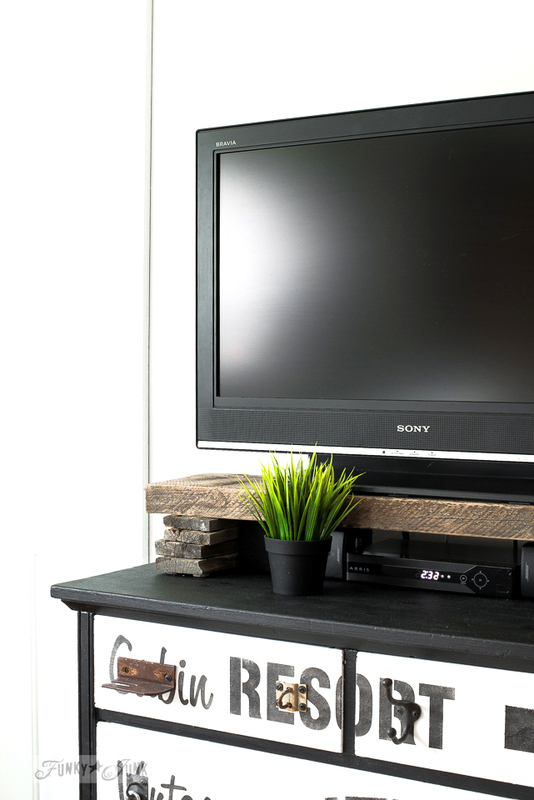 Strap or screw the TV to the shelf from behind for stability. 9. Insert, “WOW, it worked and I LOVE it!” here. I was truly stunned it worked so well, and looked so cool! 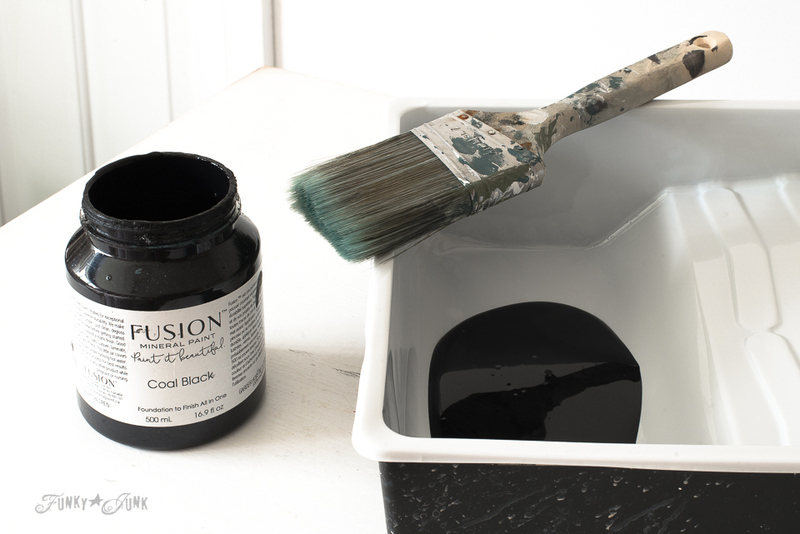 Fusion Mineral Paint in Coal Black and Casement (white). 1. 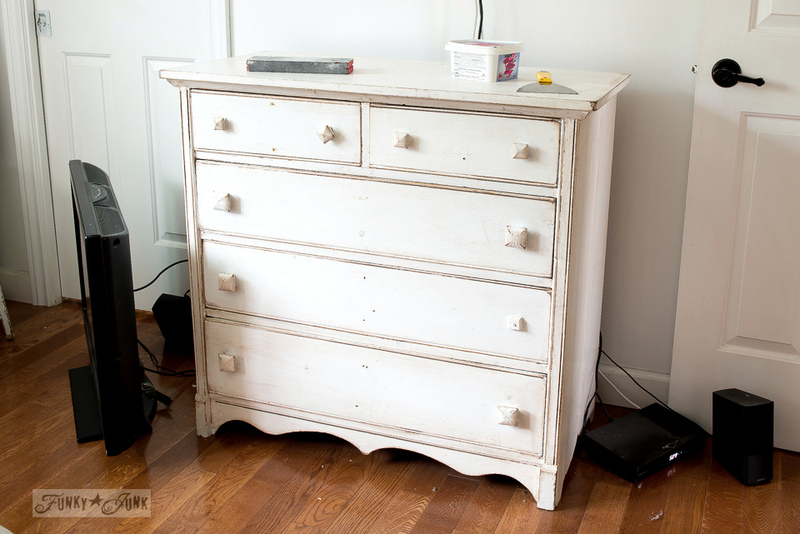 Remove knobs from dresser, then lightly sand with a sanding sponge to prep. Wipe down with a damp cloth or tack cloth to remove all dust and allow to fully dry. 2. Empty and stack drawers. 3. Stare at the towering baskets filled to the brim from contents of said drawers, and reason you’ll deal with that another day. MUCH later. 4. 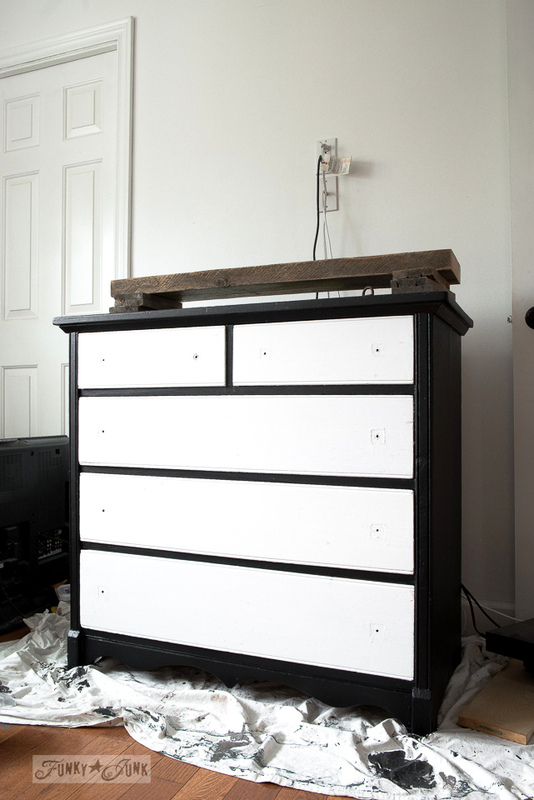 Paint the main frame of the dresser with black. I painted on 2 coats of Fusion Mineral Paint’s Coal Black. It went on like a dream! 5. Replace the drawers, and paint the fronts with white. 6. Position and tape word stencils where desired. TV shows are about little escapes all around the world. Vacation types of words were chosen to emphasize my style of escapes that I love, subway art styled. I just made sure things lined up so all the holes were filled. Kinda like doing a word puzzle. 6. 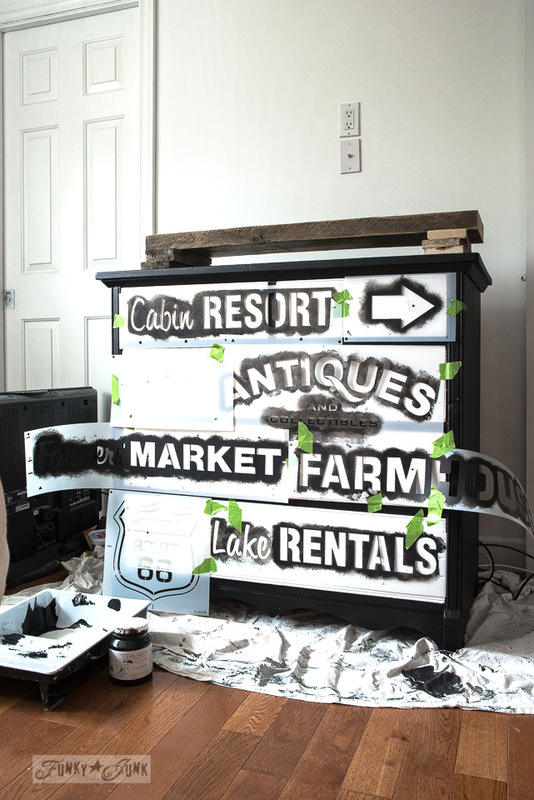 Using a dry-loaded stencil brush, each image was tapped with Coal Black. It went on beautifully! I tapped the brush to darken the image as much as possible. 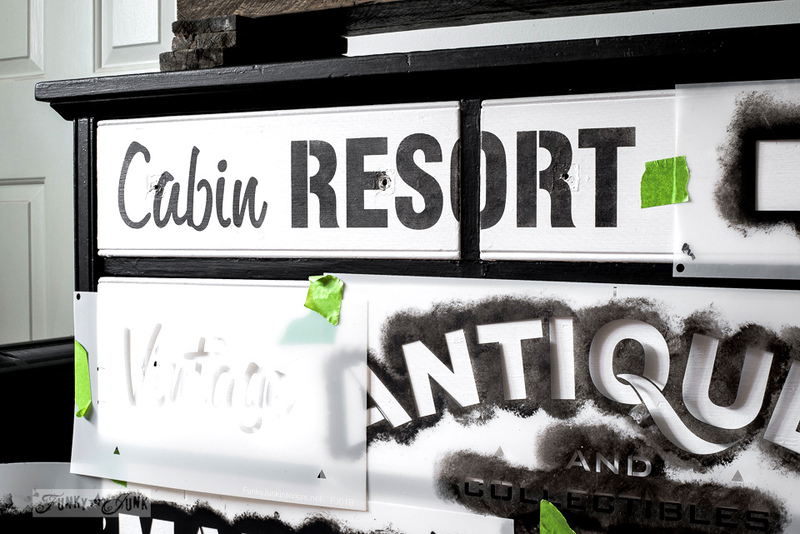 Learn more about how to stencil HERE. 7. Add some rusty junk for the handles (because you can), and call it done! Of course if little black or white knobs are more your thing, that would send all the focus back on the lettering, looking equally pretty. However, you know me… it ain’t a finished project without junk. I was going to glaze/age the drawers at first, however I fell hard for the crisp black and white contrast against those white walls, so for now it will stay. What do you think? Could they use aging or do you like them as is? 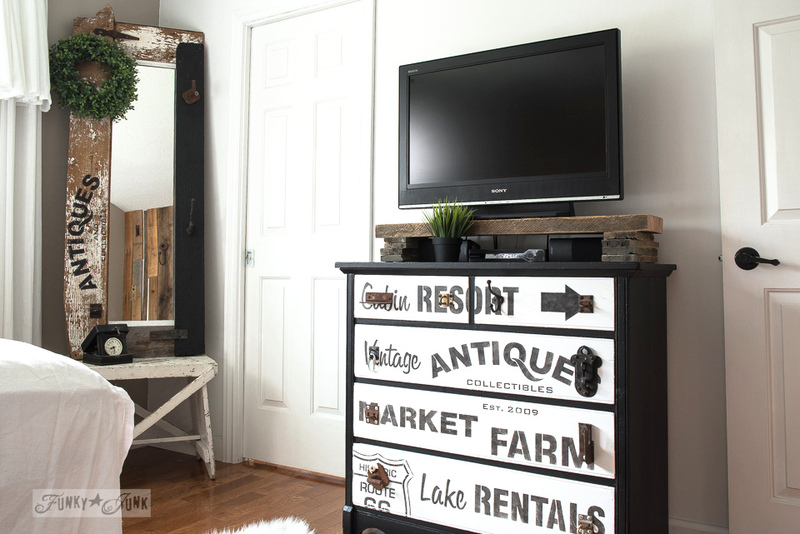 Regardless, I am in LOVE with the dresser’s new look along with the Antiques Mirror and faux barn door headboard! 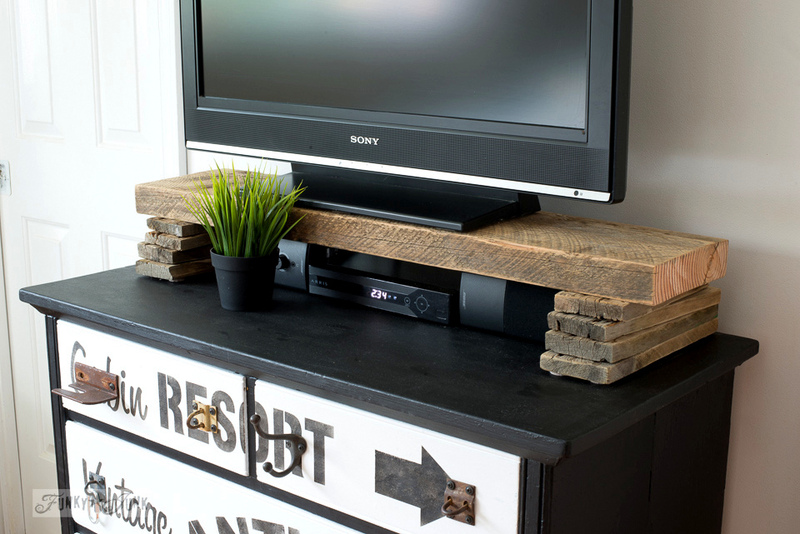 If you have to have a tv in the bedroom, you have to have a really cool tv stand like this one! Totally awesome! Donna, I usually do not like black and white furniture but this came out amazing! 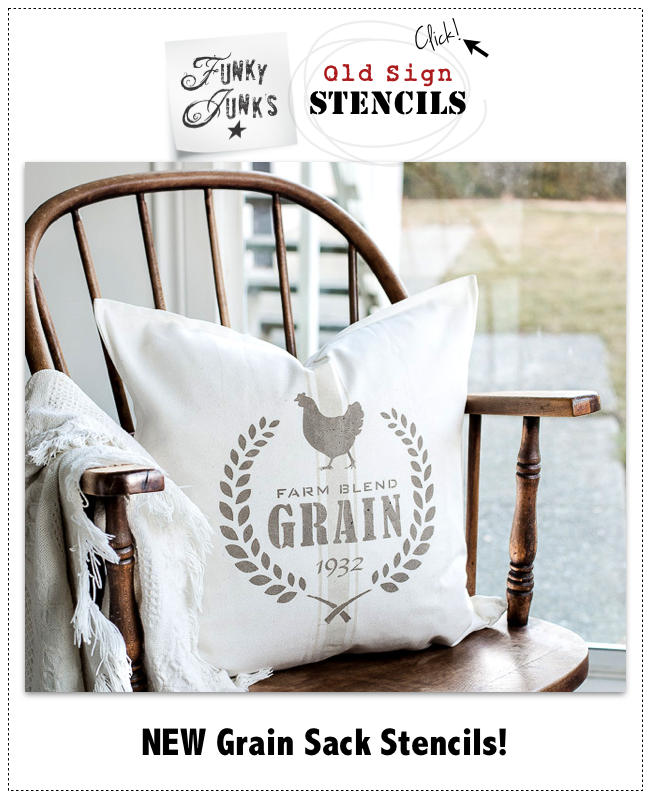 The stenciling really makes it and I love the crispness of it. In this case, I like the dresser as is. 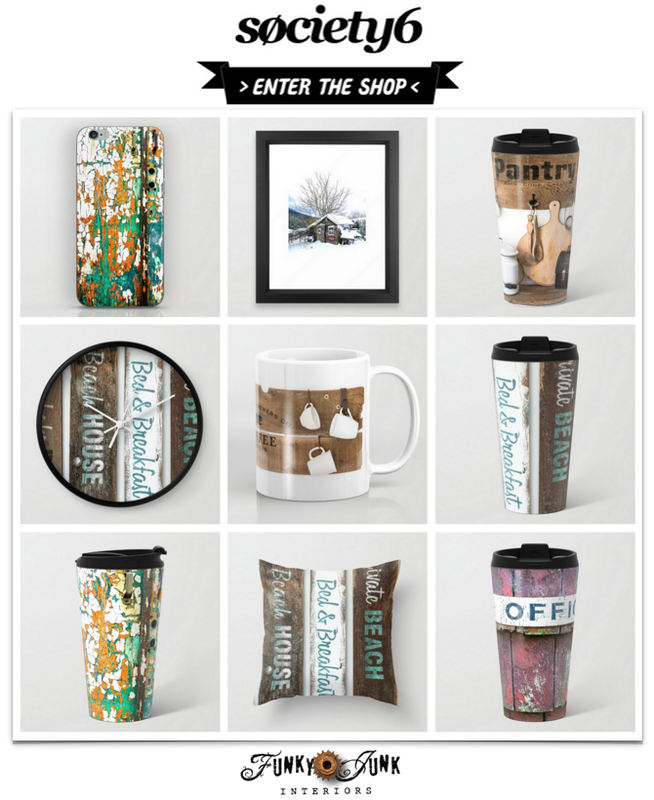 I love the crisp graphic look you’ve attained–kind of contemporary and cool! 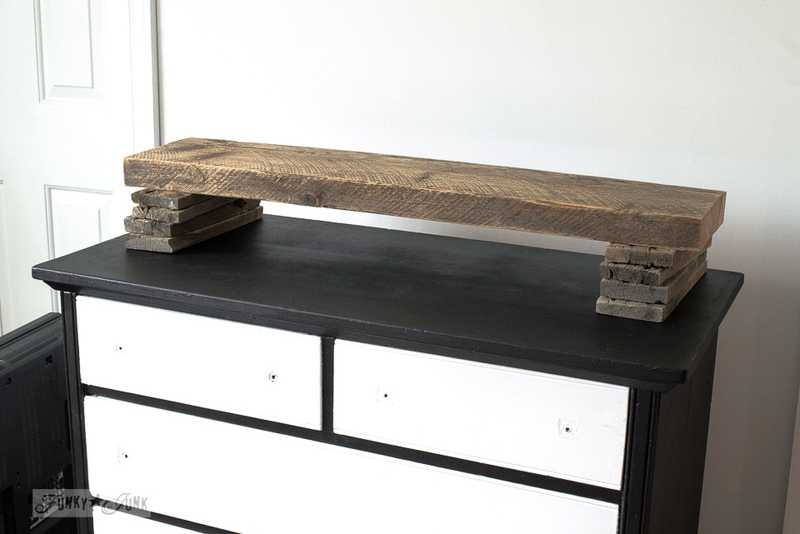 A great blend with reclaimed wood. This looks super cool Donna. Love the juxtaposition of the black and white with the wood platform. I need to get me some Fusion Paint. 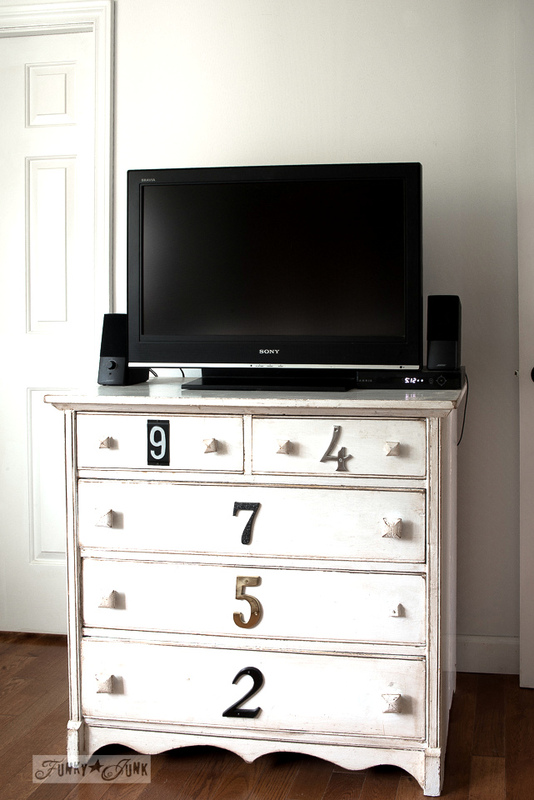 No one would ever even notice the TV because they’d be too busy oohing and aahing over the dresser! Just beautiful! Do you still have your camper? 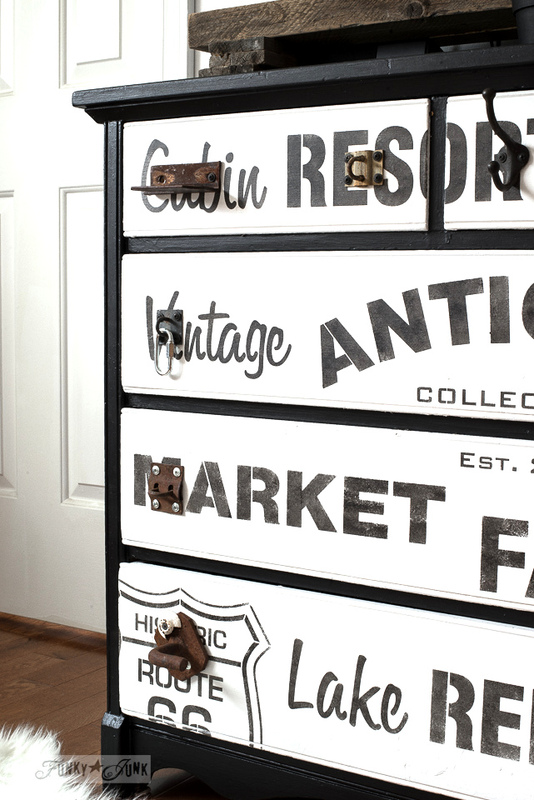 The whole things is a work of art, but I must say what I totally love is the crusty hardware you used for drawer pulls. Genius. Adds such character. It is such a neat and tidy way to handle the tv. 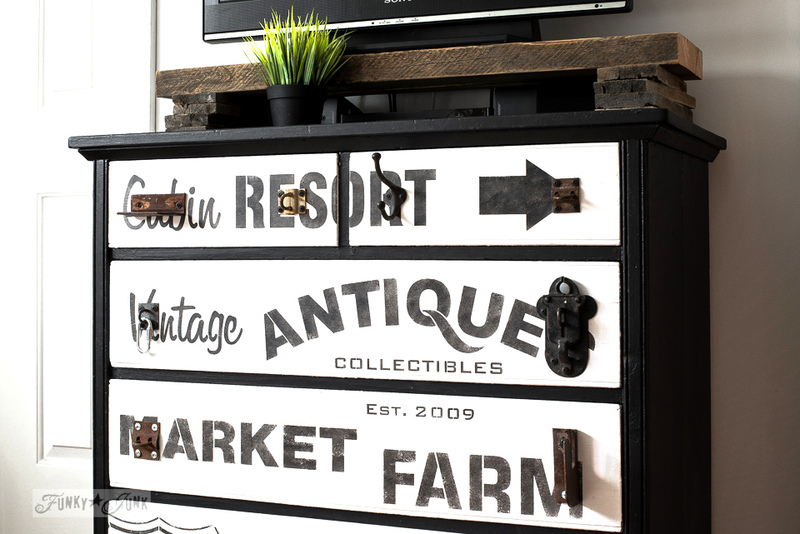 It incorporates it into the room, repeating the rustic wood, black and white theme. You did a great job on this. You know I love it!!!! 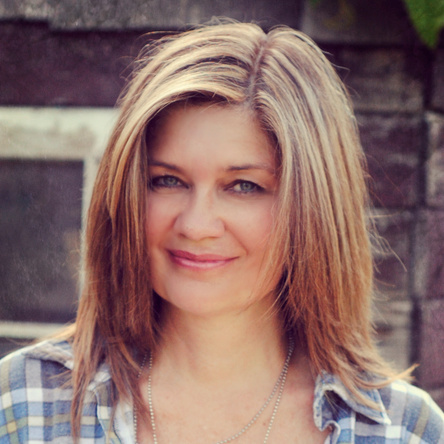 What a transformation, Donna! 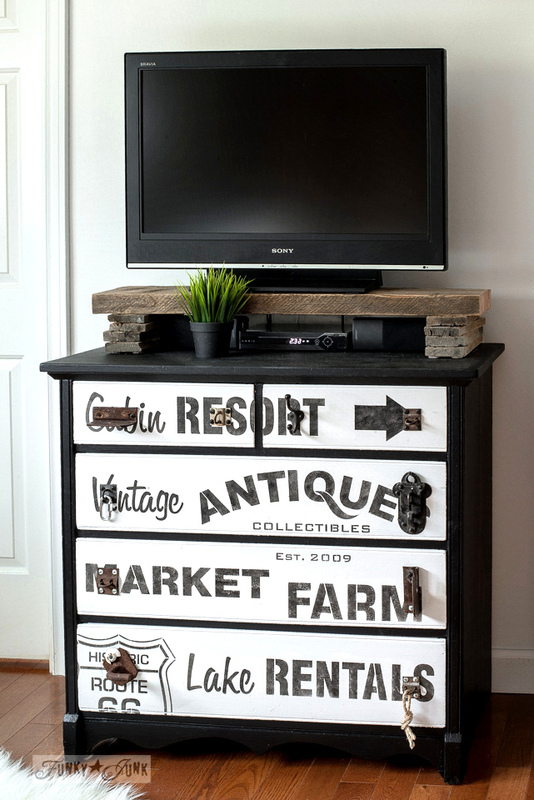 Love how your stencils look on this dresser and love how you incorporated various junk finds for the hardware. Pinned. The tv riser, looks amazing, but Donna…those junk handles! So junkalicious! !